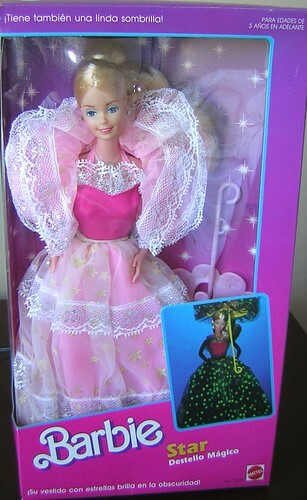 When I was a little girl, I loved Barbie. I only had one, and she was thrown out very rapidly (through no fault of my own), and I never had another. It was a generic one, but I remember standing in shops staring at all the other ones. 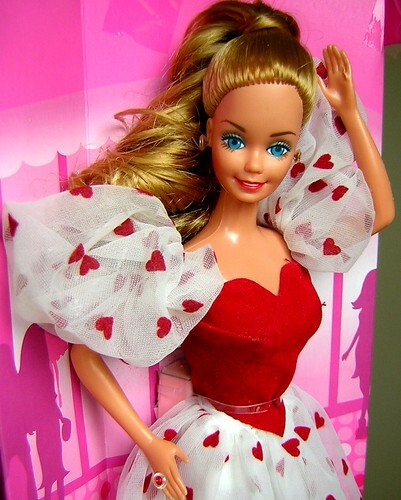 I never felt body image pressure from her, she was just a pretty doll who could be anything she wanted. Businesswoman, ballerina, astronaut. I think that’s half her appeal. Yesterday I was on placement where I saw a little girl with one. The impulse to pick it up and start playing was so strong! I thought I’d share a couple of the Barbies I coveted with you. 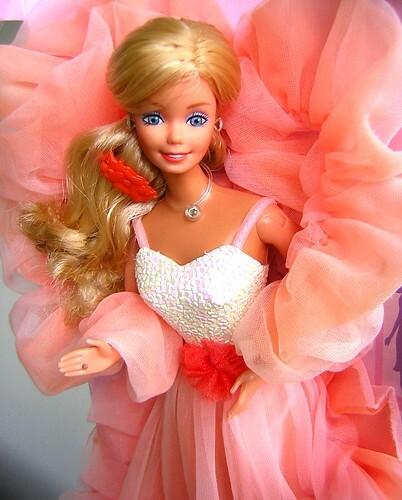 Peaches and Cream Barbie. Look at that melange of apricot and pink! Nothing says 80s like apricot. I love those colours. What girl, do this day, doesn’t like a sweetheart neckline and hearts? I don’t think I rated her dress then, and nor do I now, but people, she glowed in the dark. Le sigh. Dream Date Barbie. It felt like everyone had this. The colour combination of raspberry and such a rich lavender is genius. I would wear those colours together now if I could find them. And maybe I shall. I’ve found some much needed inspiration!